As a dietary supplement, take on (1) Cracked Energy™ capsule 15 minutes before you need energy. CAUTION: Seek advice from a health care practitioner to use this product if you have high blood pressure, heart or thyroid disease, diabetes, difficulty in urination due to an enlarged prostate, or if you are pregnant, nursing, or taking an MAO inhibitor or any prescription drug. Reduce or discontinue use if nervousness, tremors, sleeplessness, loss of appetite or nausea occur. Not intended for use by persons under 18 years of age. Do not exceed recommended serving size. Keep product at room temperature (59-86F). Do not expose to excessive heat or moisture. KEEP OUT OF REACH OF CHILDREN. MUST BE 18 YEARS OF AGE TO USE OR BUY. DO NOT USE THIS PRODUCT IF PRINTED INNER SEAL UNDER CAP IS MISSING OR BROKEN. Cracked Energy Is the extreme preworkout energy formula in a capsule format to get you going before your workout or just for pure energy! No more need for messy powders and mixers in your gym bag. 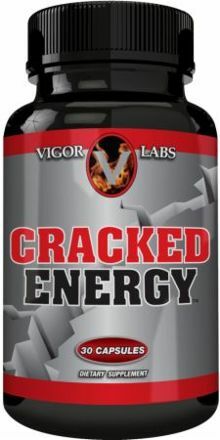 Cracked Energy (30 day supply) allows you support extreme energy in 15 minutes. * It is now easier to time your workouts and save money at the same time. Cracked Energy is not just for workouts, it helps support focus, energy, and concentration throughout your day. * No more need to stop in those gas stations and pick up an energy drink. Cracked Energy concentrates more energy than you would need into a pill with highly concentrated extracts. If you want to feel a serious energy surge and get more things done than you ever did before then Cracked Energy is for you!